Tokyo: the record skyscraper and the future forest-towns - SICOR S.p.A.
2) materials: 90% wood for a total of about 185 thousand cubic metres, while the steel component will be reduced to only 10% of the material used. Infact, it will be necessary to install a tubular steel frame for controlling vibrations. The facade of the W350 will feature balconies all around it. It is thanks to the balconies that the greenery can grow and cover the whole building, transforming itself into a vertical forest in the true meaning of the phrase. Each floor will have the view on all four sides of the building and will be enriched with plants that will filter the sunlight, thus demonstrating that the Vertical Wood of Stefano Boeri (Boeri Studio) remains a model that has crossed the Italian borders to teach to “furnish” bringing nature back to the center of our urban habitat. Inside the structure of the skyscraper will be a hybrid between wood and steel and will have to take into account the anti-seismic parameters imposed on Japanese construction for high-risk earthquakes. About 185 thousand cubic meters of timber needed for construction. On the other hand, the country launched a law in 2010 that requires construction companies to use organic material for public buildings over three stories high. 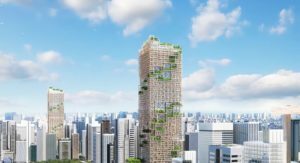 Finally, the wooden skyscraper, in addition to the height, will also record a record for costs: 600 billion yen (about 4.5 billion euros) is the figure expected, twice as much as a building of equal size built with techniques and traditional materials (cement, steel and glass). The W350 tower is a project by Sumitomo Forestry. The building will be inaugurated in 2041 and the estimated cost is 600 billion yen (4.5 billion euros). In Japan, environmental sustainability has been important for more than a decade, the only claim against the W350 tower is the excessive use of wood. 68% of Japan is covered with forests. After Finland, it is the second greenest country in the world. The problem of deforestation does not therefore arise at the moment. However, a programme of planting new trees is already underway, which will reforest where were the trees used to build future forest-towns.